A new world’s wealth report released by Credit Suisse Financial Group claims that for the first time in history, the top 1% of the world’s richest now owns 50% of all the wealth. 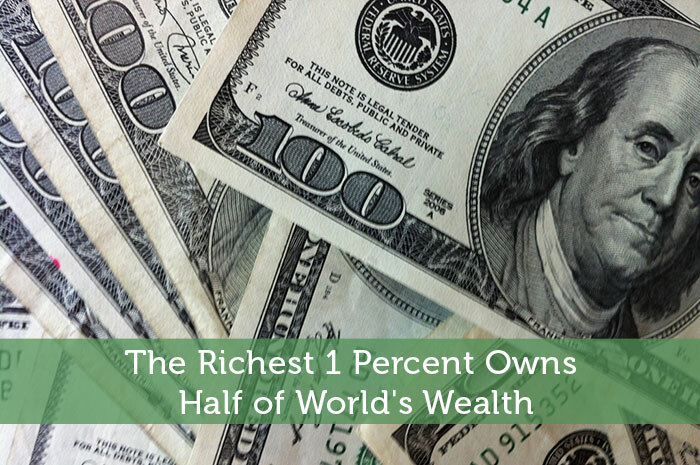 This means the most privileged 1% has more financial assets than the remaining 99% combined. In this report wealth is defined as the value of net assets including property, businesses, and stock market investments. Statistics gathered from across the world was normalized to $US for comparison purposes. The report estimates that there is a total of $250 trillion in global assets. 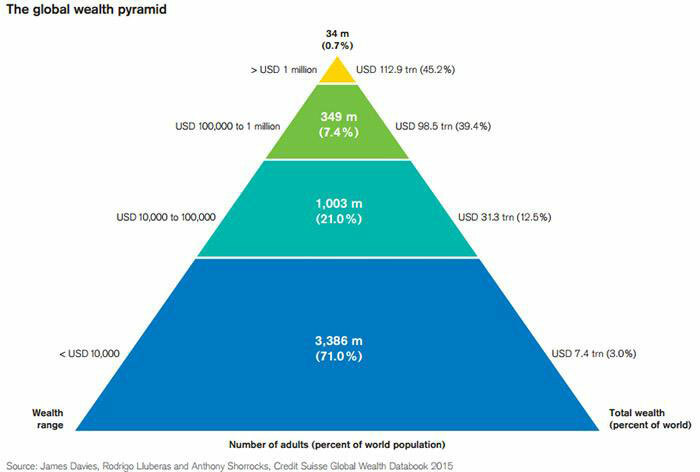 Below is the global wealth pyramid from Credit Suisse which shows the breakdown of how wealth is distributed by class. The large base of the pyramid reflects that 71% of all adults around the world have less than $10,000 to their names in 2015. A further 21% fall in the $10,000 to $100,000 range. Finally, the remaining 8% have net worths above $100,000. This last group includes 34 million millionaires, who makes up only 0.7% of the world’s adult population, but owns 45% of all household wealth. It is estimated that 123,800 adults within this group have more than $50 million, and 44,900 have over $100 million. In the context of global wealth, the 1 billion adults that comprise the $10,000 to $100,000 middle class wealth band owns a combined net worth of $31 trillion which provides this group with a considerable amount of economic influence. India and Africa are under-represented in this tier, whereas China’s share is relatively high. In most countries, the wealth of the middle class and beyond has grown considerably over the past 15 years. The report shows an expansion in the number of middle class adults from 524 million in 2000 to 664 million in 2015, an increase of 27%. Global wealth is expected to reach $345 trillion by the mid 2020s, that’s 38% above what it is today. This is an important metric to consider because it can act as a benchmark for everyone in the global economy. So where do you stand in terms of relative wealth? Having just $3,200 in the bank will already put you in the top 50% of the richest in the world. A net worth of $10,000 will put you in the top 29%. $68,800 would secure you a place in the top 10% of the world’s richest. $100,000 would put you in the top 8%. And $759,900 is needed to be in the top 1%. The 1% already owns half of all the world’s assets, and I bet they’re working hard to get the rest. 😉 The world isn’t always fair but it’s up to each individual to compete and earn their slice of the global wealth pie. For those of us in the middle class we are already in a privileged situation because there is a lot of resources for us to get ahead. All we have to do to get to the next tier of the wealth pyramid is to adopt a positive mentality towards money and wealth. Rich people attempt to create a specific life for themselves while the poor often believe they have no control. If people work hard, seek out opportunities, and remain focused then getting into the richest 1% club can be a reality for many people who are currently middle class today. As a person who falls in the top 10% and probably closer to the top 7% I have to agree with you. Moving up the wealth pyramid is about taking a positive mindset towards money. It is about being creative, using assets and debt to our advantages, living within our means and working to build a fortune that generations to come can continue to grow and the next generations can grow. Yes there are wealth stories of 20-30 year olds creating companies and becoming billionaires but for the majority it is about being consistent with money and sticking to principles of solving problems, reinvesting, and using debt to our advantage. Very insightful post about the global income divide. Poverty levels may be shrinking, but more and more people are sliding into the lower income group because the rich keep getting richer. In this scenario, I do marvel at the generosity of famous billionaires who pledge a vast amount of their assets to charity. If this 1% gave away even a fraction of their total assets to solve third world problems, there will soon be no third world.